The Hermiston High School Golf Association is putting on a 2-person scramble on April 20 at the Big River Golf Course in Umatilla. The cost $60 per person for adults and $40 per person for students. The tournament will include hole events, raffle prizes, a silent auction and a barbecue dinner after the tournament. Send entries and make checks payable to Hermiston High School Golf Association, P.O. 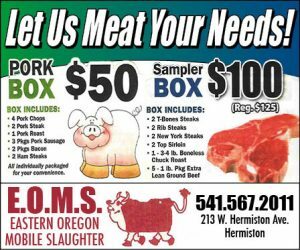 Box 1444, Hermiston, Ore., 97838 or turn entries into the Big River Golf Course. Carts are not included. To reserve a cart, call 541-922-3006 by April 15. Go online to download the registration form.